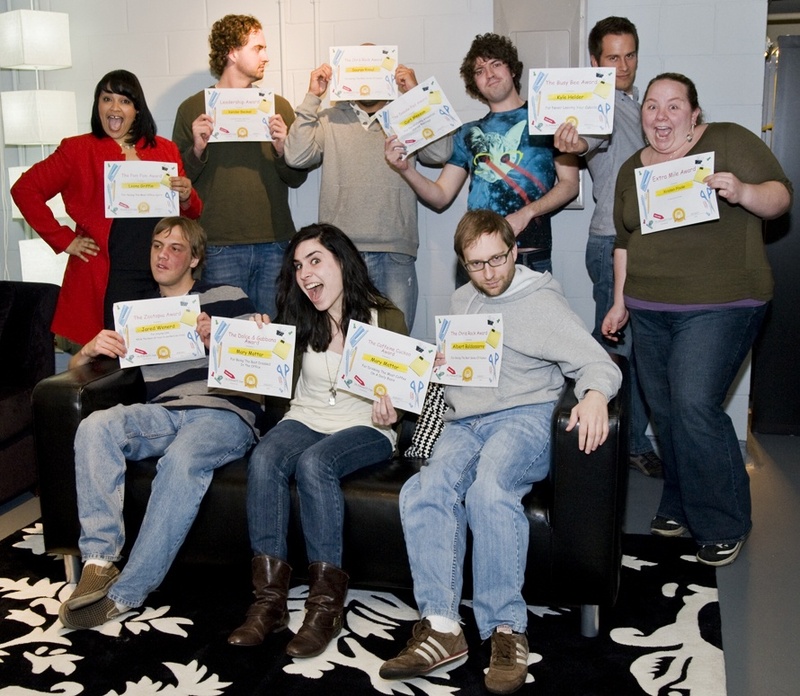 What does a team of award-winning web designers, brilliant (and I do mean brilliant) web developers, Google Certified PPC managers, seasoned SEO analysts, social media gurus and link building geniuses do when they’re not busy enhancing and optimizing websites, increasing web traffic and search engine rankings or making websites look absolutely stellar? Reward ourselves for all of our hard work of course … with awards to frame and hang up in our cubicles. At the recent celebration of our impressive new office, we voted on the following superlatives so we could finally find out what our co-workers truly think of us. The Megaphone Award (Because we can hear every conversation he has over the phone) – And the award for the loudest person in our office is our very own president, Mr. William Craig. No one on the other line (or across the room) ever complains about not being able to hear him or understand what he’s saying. No wonder he makes such a great leader. The Chris Rock Award (For having the best sense of humor) – This one was a tie (sorry you have to share your coveted award). But the funniest individuals in our office are clearly Al Baldassarre and Saurav Rimal. Ask either one of them to hear a joke. They love telling them. What’s ironic is Al is only here 2 days a week and Saurav just hopped on board to the WebFX team; they’re obviously twice as funny as the rest of us. This sense of humor is much appreciated by their co-workers. The Busy Bee Award (For never leaving his desk) – Kyle Helder. Kyle really is always at his desk. Yet, when you need the help of his expert eye in making a website look even better, this talented web designer is right there to help (because he’s just an instant message away). But really, it’s just because he’s such a hard worker and loves what he does (not to mention is great at it). The Extra Mile Award (For always giving 110%) – Kristen Poole. She’s one excellent Project Manager, and she really does excel at every project she takes on. Her extra effort is admired and obviously appreciated by her clients and co-workers. The Dolce & Gabbana Award (For being the best dressed in the office) – Yours truly. Maybe it was the fact I minored in fashion in college, maybe it’s just my extreme appreciation for clothing or perhaps it’s my acute attention to detail. Either way … I’m meticulous and thorough; that’s probably why my co-workers love to have me proof their web copy. The Doodle Pad Award (For never paying attention during meetings) – Curt Meeson. So it’s not that he doesn’t pay attention in meetings (for the most part) as he continues to sketch – it’s the artist in him. No wonder our web design is top-notch and companies large and small love our website redesign services; our lead web designer never stops drawing! He’s an artist by day … and an artist by night. The Caffeine Cuckoo Award (For drinking the most coffee on a daily basis) – And once again, yours truly. I know what you’re thinking … I’m not ashamed. It keeps me awake and alert to focus on the task at hand. I’m a firm believer in the fact that the coffee machine I had the privilege of picking out allows us all to be more productive and twice as efficient. The Zootopia Award (For staying calm while the rest of the team goes crazy) – Jared Wenerd. He’s a brilliant (and I do mean brilliant) programmer. Enough said? I for one don’t even understand what zootopia means … Jared’s probably the only one who does. That’s probably why he was a shoe-in for this award. The Drinking the Water in Mexico Award (For biggest risk taker) – Xander Becket. Anyone who knows Xander knows he’s willing to take a risk for the greater good. Not sure if he’d be willing to actually drink the water in Mexico, that may be a bit of a stretch, then again … I can’t speak for him. To me though, it just makes him an even better Internet marketer. No wonder he’s known for doubling ROI for PPC management campaigns. At WebFX we recognize our individual personalities and talents, and our management appreciates our unique tendencies because they’re what make us great at what we do. Speaking for all of the winners, we’d like to thank our co-workers for acknowledging and appreciating our inimitable quirks.